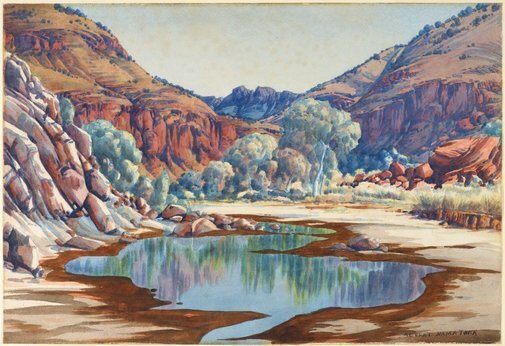 Initially thought of as having succumbed to European pictorial idioms – and for that reason, to ideas of European privilege over the land – Namatjira's landscapes have since been re-evaluated as coded expressions on traditional sites and sacred knowledge., Ownership of country is hereditary, but detailed knowledge of what it 'contains' is learnt in successive stages through ceremony, song, anecdote and contact. Namatjira's father's country lay towards Mount Sonder and Glen Helen Gorge, in the MacDonnell Ranges, and his mother's country was in the region of Palm Valley in Central Australia. In Namatjira's paintings, the totemic connections to his country are so indelible that, for example, Palm Valley the place and 'Palm Valley', c.1940s, the painting seem to intersect, detailing Namatjira's artistic, cultural and proprietorial claim on the land. Namatjira's skills in European watercolour painting were interpreted as evidence of the potential success of assimilation policies. In 1957, Namatjira became the first Aboriginal person to be granted conditional Australian citizenship. This entitled him to limited social freedoms and to live in Mparntwe, although he was prohibited from purchasing land. His relations, including his children, were not permitted the same privileges. After an incident in 1958 that didn't directly involve the artist, Namatjira was charged with supplying alcohol to members of the Aboriginal community – at the time, it was illegal for all Aboriginal people, except Namatjira, to possess and consume alcohol. Namatjira was sentenced to six months labour at Papunya and this, exacerbated by the authorities' refusal to allow him to purchase the land of his ancestors, caused him profound despair. He served only two months, and died shortly after. The more recent, dramatic success of the nearby Papunya Tula movement must be read against the history of its predecessor, the Hermannsburg school, which has endured for half a century. Recently, the centenary of Namatjira's birth was celebrated with a major retrospective at the National Gallery of Australia, Canberra. Signed l.r. corner, black ink "ALBERT NAMATJIRA". Not dated. George Alexander, Tradition today: Indigenous art in Australia , 'Albert Namatjira', pg. 98, Sydney, 2004, 98, 99 (colour illus.). Bruce James, Art Gallery of New South Wales handbook , 'Australian Collection: Aboriginal and Torres Strait Islander Art', pg. 208-241, Sydney, 1999, 211 (colour illus.). Courtney Kidd, The Sydney Morning Herald , 'Natural-born thrillers', pg. 17, Sydney, 25 Jan 2000, 17. Vivonne Thwaites, Holy Holy Holy , 'Introduction', pg. 4-12, Adelaide, 2004, 12 (colour illus.). Like, Art Magazine , Melbourne, Oct 1996. AGNSW Collections , 'From Colonialism to late Modernism', pg. 7-106, Sydney, 1994, 100 (colour illus.). Yiribana , Sydney, 1994, 9 (colour illus.). Advance Australia Fair , 1991, illus.. In our own image: the story of Australian art , Sydney, 2002, 153 (colour illus. ).